The daughter of a political opponent of the Somali dictatorship, Ayaan Hirsi Ali grew up surrounded by her family in exile. Her traditional upbringing continued from Somalia to Saudi Arabia and then to Kenya, where she first awakened to the need for women’s rights. 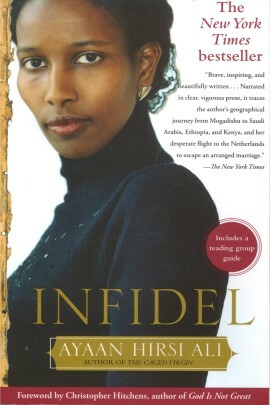 Having been forced through female mutilation, Hirsi Ali finally fled for Holland from her family on the eve of an arranged wedding. A political refugee in her new country, she worked menial jobs while earning a college degree in political science, all the while becoming vocal advocate for women’s rights and an “enlightened Islam”, and eventually playing an influential role in the Dutch parliament. 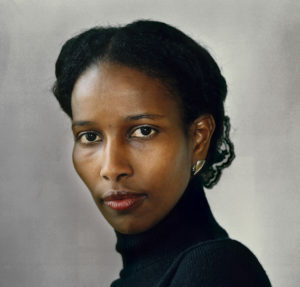 Ayaan Hirsi Ali gained international attention following the murder of Theo van Gogh, who had directed her script for the short film Submission. The murderer left a menace to Hirsi Ali pinned in van Gogh’s body and she has since lived with a 24 hour police guard. But even though she is under constant threat – demonized by reactionary Islamists and politicians, disowned by her father, and expelled from her family and clan – she refuses to be silenced. A celebration of triumph over adversity, Infidel tells how a bright young girl evolved out of dutiful obedience to become an outspoken, pioneering freedom fighter. No story could be timelier or more significant.